Curved pan stairs have stringers on the sides of the stair, and riser plates in addition to tread plates. The term pan-stair comes from traditional cement-fill pan-type stairs, but these pans can be made to receive stone, wood or even glass steps. Curved pan stairs are customized and created for your space and traffic pattern and can become a modern staircase or a contemporary staircase. We can make them attach to a side wall, or make them free standing. Curved stairs like this have the stringer or skirt as a prominent feature. The stringer provides the strength of the stair at the side of the stair. These steel or stainless steel stringers provide a ribbon-like appeal as they flow up the curvature of the staircase. This type of stair typically has the handrail installed outboard of the stringer or in-line with the stringer. It is possible to have the balusters attach to the treads, but it is more common to attach to the stringer alone. 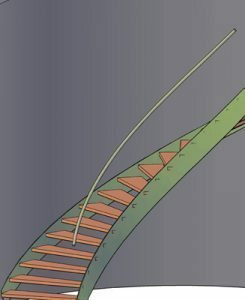 This is a rendering of a curved stringer stair. The stringers are the supports at the perimeter of the treads. The picture shows an open riser, but these stairs can have closed risers as well. 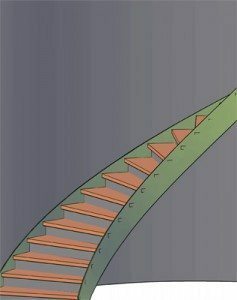 This is a rendering of a curved metal stair with closed risers. The treads and risers can be wood or metal. It is also possible to have wood steps and a steel riser plate.